Recent release “Willie’s Gap” from Page Publishing author Delbert Willcutt is an entertaining book of fictional tales for readers of all ages. Inspired by the author’s own family and hometown, these stories draw a charming portrait of American life in the last century. Delbert Willcutt, a father of two who was born the ninth of thirteen children on a small farm in rural central Arkansas, has completed his book “Willie’s Gap”: a nostalgic collection of engrossing stories celebrating a bygone era. Published by New York City-based Page Publishing, Delbert Willcutt’s book is an engrossing work of fiction painting a vivid portrait of midcentury small-town America. 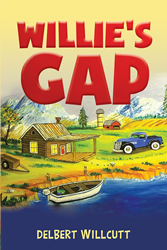 Readers who wish to experience this engaging work can purchase “Willie’s Gap” at bookstores everywhere, or online at the Apple iTunes store, Amazon, Google Play, or Barnes and Noble.